I recently upgraded postgres to the latest version and I think the steps can help someone else too. So here they are. This assumes Centos 7 server installed. First SSH into the server. I usually use all_db.sql as the filename, but you can use whatever. Since the file gets dropped into the pgsql folder, good to move it out of there into your home directory, since we are removing old versions of postgres. Use CTRL^d to get out of postgres. Does the file get listed? Good if yes. If not then you didn’t follow the above exactly. Right now postgres 9.6 is the latest version, but in the future you can follow the same steps replacing 96 or 9.6 with 97 or 9.7 etc. Copy the link for the OS you have. … in the next command. 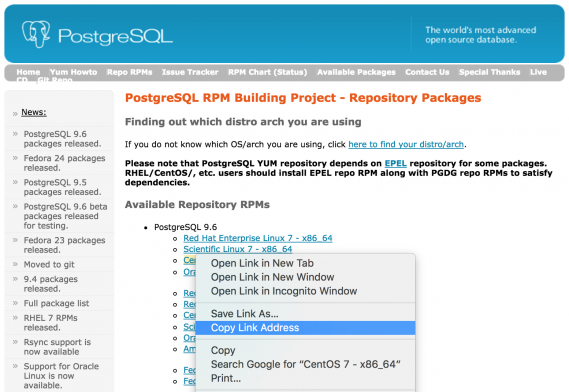 If this install of postgres needs to be accessible to the outside world, you can open it up. We’re using firewall rules on the server which opens port 5432 only to certain IP addresses. So without that additional step, you would want to be careful with the below. Exit the file saving changes. On the second line beginning with ‘host’ make sure there is no # added. You want it to read as above. If you had different users setup in postgres, add them again. Replace user_name and pass_word with yours. Make the user a superuser if that’s what you want. Mentions: Thanks to http://tecadmin.net/install-postgresql-9-5-on-centos/ for help with the rpm and install steps.